St. George Pioneers built many of the structures in town with sandstone quarried in the local red rock hills. 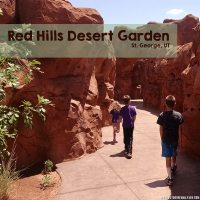 St. George is lucky enough to have 2 quarry trails that we can travel on to experience our local history as well as enjoy our beautiful scenery. The Pathway to the Quarry trail walks you through the pioneers efforts of extracting sandstone. The red sandstone was used in the main structure of the LDS temple (mormons), the LDS tabernacle, the original Washington County courthouse and more. The other quarry trail can be found on St. George’s Black Hill, called the Temple Quarry Trail; here you travel to the area where pioneers extracted black lava rock. This lava rock was used in the foundation and basement of the LDS temple found downtown. The Pathway to the Quarry is accessed off of Diagonal. If traveling north on Bluff street, take a right on to Diagonal (just before the big green overhead street signs). Turn left on to 700 West. You won’t feel as though you are at a trailhead as you will be traveling to a residential dead-end, but look for the Dixie Red Hills Golf Course in the background and the large trailhead marker and monument. There is not a parking lot, so please be mindful of no parking signs and the residents that live there. There is plenty of parking on the roadside, outside of the no parking notations. The trail begins with a lot of information and even maps for you to take. 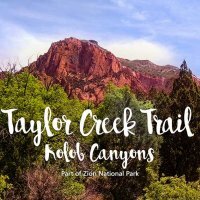 I suggest taking a moment to read about the trail before you start. The trail begins right on the golf course itself. The trail is well marked with dark brown gravel. Once you are ready to go, simply follow the trail. The fencing system seen below is actually to help keep the desert tortoises within the designated area. 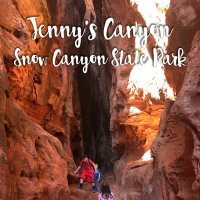 This is a fun little tidbit to share with the family on the trail! 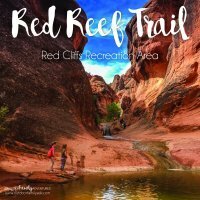 This trail is incredibly easy for families of all ages. There are steps and dirt inclines; if you are traveling with very young children, or a senior that may have balance issues, be cautious. It is a very short trip, so taking it slow won’t be a problem for your day. My 5 year old traveled this with no help, but I will say that he did fall down a handlful of times on the loose rocks when coming down hill or trying to run and keep up with his brother and sister. He could have also just been having a bad day, because you know, that 1/3 mile was so terrible when he hadn’t eaten lunch yet! 😉 Truly the trail is easy. There are stairs in a few places. It is not stroller friendly and is not wheelchair accessible. Make sure to look close at ALL the rocks used to create stairs. They were pulled from the quarry. Some of them still have markings from the pioneers. 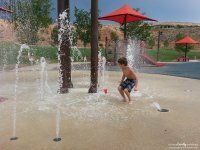 It’s a great item to have the kids look for as they walk the trail. See those big piles of small-ish rocks? That’s not natural! There’s a reason for those. The end of the trail will explain. Point them out as you move down the trail; my kids didn’t even notice the “chip piles” until we were at the end and reading about them. Make sure you really read the plaques available at the end of the trail. It talks about how they actually broke the stone into the sizes needed for building and transport. It also explains what the residual markings are that you can see today and how those are made. I was always told that it was the dynamite markings, but based on these explanations, that’s not exactly true. They quarried the stone using a “feather” and “plug” method! My favorite part of the trail was simply the natural beauty. It was strange to look to my left and see the golf course and golfers in their carts zooming around. But if you turn your head to the right, you felt as though you were in the middle of nowhere. It truly is a hidden gem. Keep your eyes peeled for lizards and wildlife. One sketchy lizard found his way across my daughters feet! Super short! Only 3/10 a mile (only about 528 yards!). Quick trail! We did this, roundtrip, in about 40 minutes (with time to sit, read the plaques and play). Gains approximately 100 feet in elevation. New trail! Dedicated in March 2016, the trail is clean and not very busy. In town! Right off Diagonal and 700 west. Because you cross the desert reserve, please stay on the trail. No out of control yelling or screaming, please! This trail is in the midst of the golf course and residential areas. You are close to many people and a desert reserve…so don’t get too crazy. There are stairs! No strollers or wheelchairs. View a short video of us on the trail (Facebook Live video).